How to Make Baby Nursery Wallpaper Letters. A Frugal Nursery Wall Decor Project. Nursery wall letters are a popular form of nursery wall decor. With a little bit of imagination they can be used in many ways to decorate your nursery walls. There are plenty of nursery wall letters available in the baby boutiques and stores, and they are gorgeous, I'm sure we would all agree, but let's face it, at $15 to $20 a pop they can really start to add up, especially if you want to put the entire alphabet around the edge of the baby room as seen here. Luckily the alphabet letters in this picture are easy to make yourself using a word processor and some baby nursery wallpaper off cuts. Go to your local store and ask for off cuts in a variety of patterns and colors to match your nursery design. Most places will give them to you for a few cents each. If you can't find baby nursery wallpaper you can always use patterned card stock from Michael's. Use your word processor to print out the letters in your chosen font as large as you need them. You can use different ones for each nursery letter if you like. Tip: if you want larger than A4 print them out on A4 then get them enlarged to A3 on a photocopier. Cut these letters out to make your templates. Cut out your decorative nursery wall letters. You can apply two or three layers of modge podge to each letter to make them a little harder wearing if you want to, but be careful, sometimes this makes the nursery wallpaper curl as it dries - it depends on the paper. And that's it. Let them dry and they're ready to use! 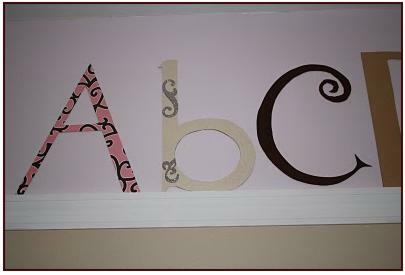 These inexpensive nursery wallpaper letters are perfect for creating an alphabet border in your baby nursery. They are most effective if you stick them above or between chair rails. You can also use them to create a monogram of your baby's initials; spell your baby's name across the room; create an alphabet cloud or use them as part of an alphabet nursery theme. Visit my nursery wall letters page for several more frugal, handmade baby nursery letter ideas. More about baby nursery wallpaper. Don't have time to browse all the pages on this site? Take a look at our e-book package. Baby nursery decorating information from this site conveniently condensed into an easy to read, printable format ready for instant download.